Fists of Fury is regarded as one of the most iconic martial arts movies in history and now a creative YouTuber has given it a Star Wars makeover. The incredible video shows Bruce Lee in top form, using his nunchucks, but they've been turned into Lightsabers. Fists of Fury came out in 1972, 5 years ahead of Star Wars, and was originally called The Chinese Connection in the United States due to a production error. Now, Bruce Lee is seen as a Jedi master. 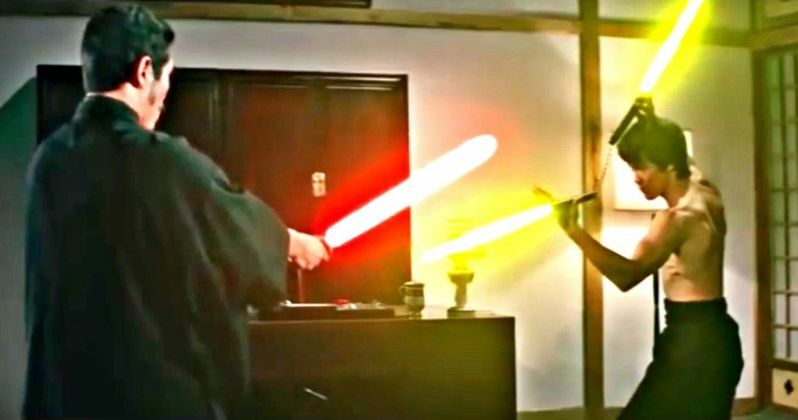 YouTuber Patrick Nan has taken existing footage of Bruce Lee and made one of the most epic Lightsaber videos in fan-made history. Similar videos have been made in the past, but the quality in Nan's video is unmatched from the graphics all the way down to the sound effects. The video starts with a message from Patrick Nan that says, "So I saw an image of Bruce Lee with lightsabers and decided to create a scene re-creation of Fist of Fury with lightsabers." It really is a wonderful work of art and makes the Fists of Fury scene just that much more intense. Bruce Lee's nunchuck Lightsabers being yellow is the perfect addition. Patrick Nan's video is the latest Lightsaber video to show up in the last week. Another video, which is just as well done, but much shorter, features the famous Porgs of The Last Jedi playing with a Lightsaber while one of them gets a hole blasted through it. Although it is unclear, it looks like both YouTubers utilized Adobe After Effects to engineer the videos along with a lot of extra free time to create something as complex as a Bruce Lee fight scene with Lightsabers. Some of the comments for the video wager that the whole process took up to 48 hours of work to complete. In other Bruce Lee news, it was announced just before last summer that a biopic of his life, Little Dragon, was in the works. The movie is said to be co-scripted and produced by Lee's daughter, Shannon Lee, who runs Bruce Lee Entertainment, a division of the Bruce Lee Family Company, which is dedicated to promoting and protecting Lee's legacy and ideas. The movie will be about Bruce Lee's early days in the 1950s and has Shekhar Kapur attached to direct the project. However, there have not been any real updates since May of 2017, but the movie is rumored to be in pre-production. The computer is a powerful tool, almost as powerful as the sword and nunchucks used in Fist of Fury these days. The new video is a perfect blend of a tribute to Bruce Lee and Star Wars, which is something that fans of either should definitely check out. You can check out the epic Fists of Fury and Star Wars mashup in all of its martial arts and sci-fi glory below, courtesy of Patrick Nan's YouTube channel.